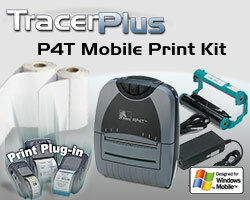 This print kit features the P4T Thermal transfer Printer and TracerPlus Print Software, everything you need to give mobile printing capabilities to your TracerPlus enabled workforce. The P4T printer coupled with TracerPlus Print enables end users to print labels at the point of activity that withstand harsh environments and offer archival longevity ranging from 18 months to up to 10 years in outdoor applications. TracerPlus Print stores multiple print formats so end users can toggle between receipts, labels or any other print job they may have.